is a playwright and performer from the Bay Area with an MFA from Northwestern University’s Writing for the Screen and Stage program. Milta’s play, You, Me and Tuno was a finalist at Downtown Urban Theater Festival 2013 in New York City. Her play Fleeing Blue won the Wichita State playwriting contest with a production in November 2012. Her play, Last of the Lilac Roses was a runner up finalist at NYC’s Repertorio Español, Nuestra’s Voces play contest 2011. She served as a member of ATC’s Chicago Chronicle docu drama playwriting team 2012. Milta has been awarded grants from City of Oakland Cultural Arts and Zellerbach Family Foundation to write and perform her solo work. Milta was co founder of HyPE theater troupe and one third of Las Manas Tres Spoken Word troupe. Milta has taught creative writing to youth for over five years and most recently screenwriting to undergraduates at Northwestern University. She’s published in WritersCorps’ Teachers Anthology, Days I Moved Through Ordinary Sounds, with her students in City of Stairways: A Poet’s Field Guide to San Francisco, and in Teaching Artist Journal. She earned a BA in Creative Writing from San Francisco State University. is a theatre maker, musician and educator who has worked with Magic Theatre, Campo Santo, El Teatro Campesino, Su Teatro, and Steppenwolf among other notable companies. In 2008, he received a three-year directing residency at La Peña Cultural Center in Berkeley, California, from the Doris Duke Foundation, during which he founded the Hybrid Performance Experiment (The HyPE) known for their guerrilla theatre performances on Bay Area Rapid Transit trains and other public spaces. As a spoken word poet, Pinate won the 1999 National Slam Poetry Championship, and fronted the group Grito Serpentino, a spoken word and music ensemble which toured extensively in California and throughout the country. Pinate was a faculty member at San Jose State University’s department of Television, Radio, Film and Theatre for eight years, and from 2004 to 2010 he served as the program director for Galería de la Raza, the longest running Chicano art center in the country. 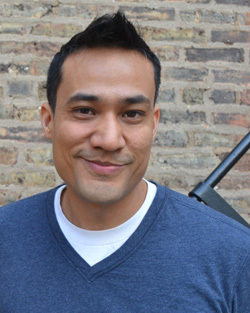 He recently graduated with an MFA in Directing from The Theatre School at DePaul University. made his Borderlands debut with lighting design for Bee Luther Hatchee, and has continued being part of Borderlands by designing and Technical Directing such shows as Agnes Under the Big Top, AZ: No Roosters In the Desert, Electricidad, A Tucson Pastorela (several), and Impeach Justice Douglas, just to name a few. He has worked on a variety of Broadway shows such as: Show Boat, South Pacific, and Lion King. He has been a part of the staff of the Ordway Musical Theatre and Chanhassen Dinner Theatres in Minneapolis, Minnesota and The Pantages Centre of Performing Arts in Tacoma, Washington. Frank is presently CEO of Old Pueblo Theatrical Solutions, Inc.
began her costuming career as wardrobe mistress for the New Jersey Classic Ballet Company. She has been costuming for Tucson High Magnet School for 16 years including such shows as The Crucible and Lend Me A Tenor. She designed Doubt for Independent Productions, Man of La Mancha for Studio Connections Harvester for One 17 Productions. Past Borderlands projects include: Bruja, Lidless, She Was My Brother, Between Poncho Villa And A Naked Woman, Oedipus del Rey, Arizona: No Roosters in the Desert, White Tie Ball and Lidless. Kathy is pleased to be working with this season’s delightful array of actors. designer/audio engineer, has worked on over 80 plays. Some of Jims’ credits with Borderlands include: (6 seasons) Coyote y Culebra Youth Project touring productions, Arizona: No Roosters in the Desert; Oedipus El Rey; Lidless; and a 2005 Zonie Award nominee for sound design of Men On The Verge 2. Jim designed sound and composed for 23 seasons of “Tucson Shakespeare Under The Stars,” and has been the music director of Borderlands’ A Tucson Pastorela since 2007 and played Lucifer in the 2010 and 2011 productions. In 2011 Jim played Judge Turpin in the Arizona Onstage production of Sweeney Todd, and was in the ensemble cast of Head at Beowulf Theater. was born in Buenos Aires, Argentina, and studied Architecture at Universidad Nacional Autónoma de México (UNAM). He has combined his work in architecture with graphic design and photography. Prior set design and construction with Borderlands includes: Bruja, Guapa, Lidless, 26 Miles and White Tie Ball. He also created the video projection for the production of Bruja (2013).